A few days back, Nina Khrushcheva (teacher of international affairs at New School University in New York and great-granddaughter of Nikita Khrushchev) wrote an article in The Financial Times in which she laid out how art and culture portrays the political reality more readily and accurately than anything else. Her case is Russia, but we might look towards the more familiar US as an example. After the stockmarket crash of 1929, the more upbeat genres that produced Gentlemen prefer blondes and The Private Life of Cleopatra (though initially published in 1930, it was the product of an earlier age), gave way to the more fearful styles of Detective novels, King Kong and the reproduction of The War of the Worlds. Projecting forwards, before and in the initial stages of the Iraq war we had such imperialistic and triumphalist works as Troy, Alexander and Kingdom of Heaven. However, in the more recent music releases, as the war has soured, I have heard about three songs concerning the Vietnam war- whether it be about the draft, death or injury sustained therein. Indeed, the most politically exciting years in Irish History of late- pivoting around the turn of the eighteenth to nineteenth century- were the same years that produced Wilde's, Joyce's, Yeats' (JB & WB), Shaw's, O'Casey's, Clarke's and etc. 's most exciting works. Do people think there is a genuine connection, and if so what might we see perceive of politics today? I'm surprised you never mentioned Captain Planet and the rise of the Greens in Germany. Or the Cold War and Roger Ramjet. Alas, not everything can be included in a single post. The elite of Hollywood and the music industry chasing the dollar is one aspect of popular art responding to current events but there is nothing profound about that. If Holloywood was to do the equivalent of Arthur Miller's Death of a Salesman, in a big budget movie confronting for example, the issue of the typical American worker losing out on the American Dream while the top tier take most of the cream, then it would be news. It's rare to have a movie like High Noon (1952), which actor John Wayne termed the most un-American thing Ive ever seen in my whole life! Beyond, commercial driven art, there are films being made and books written that confront the status quo, but with a limited audience. Modern art mainly comprises soap operas and banal TV programme formats that are unashamedly imitated across the globe, if they show any audience appeal. They tried in that film, The Assassination of Richard Nixon. Awful stuff altogether. I suppose you need to combine substance with style, as Arthur Miller did. But the point of art should be representation- I'm not into abstraction for abstraction's sake. There's very little reason for the Hollywood elite to focus upon the difficulty of the American dream- that would be playing to the gallery. If Hollywood were to do it, you would have someone who looks like Kate Moss playing the poor traveller girl. They are the elite through success and it should be no suprise they focus upon that. Novels and plays will always represent the poorer element of society better because novelists and playwrights tend not to live the glitzy lifestyle. The Smoggies really deserve the credit. Have you met the Smoggies? And we have a real good time. Sesame Street, the Teenage Mutant Ninja Turtles when they had pupils, that show were they strapped guns to dinosaurs, kids just aren't getting an education anymore. What the hell is Pokémon going to teach you? You've been listening to Ray D'Arcy, haven't you? What the hell is Pokémon going to teach you? The 'must have' mentality that is essential to survive in this consumerist world without people thinking there is something wrong with you. You absolutely have to "catch 'em all" or you are some sort of social retard who lacks the necessary skills to conform. On another level it represents the globalisation of world culture. It has managed to gain world wide success because it appeals to those among us who are least concerned with cultural heritage: the kids. Children are more or less the same the world over. It is worrying from a diversity stand point to think that children across the world are now being fed the same message through our globalised mass media. [quote="St Disibod":3qb7hwhg]What the hell is Pokémon going to teach you? Also, the normalisation of slavery. I rememebr coming across an interesting article once that tracked the development of modern society from Seasme Street to Barney and Friends. In Seasme Street (I'm pretty sure I don't need to tell the poster of p.ie this) the childern interacted with characters on the Street, including a homeless grumpy guy who lived in a trash can. Generations mixed freely. The focus was on the community and society values. The action in Bareny takes place within a closed community. A safe after- school play group with limited inaction between children and thier eleders. Here the focus is on the individual. [quote="St Disibod":3797it3j]The Smoggies really deserve the credit. I can't sneak anything past you, can I? The Simpsons through to Friends is also quite telling. From a local town, family based comedy to the metropolitan promiscuity of six people whose friendship seems largely based on Warner Brothers' profit margin. But then we should be wary of such analysis. Anyone remember who said this: ""The nation needs to be closer to the Waltons than the Simpsons." I think popular culture won that round. Robbie only got 8/250 for that ? John Waters in his column today, The Irish Times pg. 14, traces the turn around in Tony Blair's premiership to a sketch by Rory Bremner in which Alastair Campbell assumes the position of something akin to a scolding mother to a naughty Tony Blair who has done something unimaginably bad- he told the truth. This, so Waters continues to explain, dragged Tony Blair's stature from being held as the optimistic, charismatic and reverent Prime Minister to being the spin doctor's puppet. Waters' article was a critique of the carnivorous nature of modern journalism, which desires hunks of flesh to feed the dwindling attention span of the nation which it itself precipitates. But it may stand as another example of art, if Bremner's material may count as such, portraying politics in a sort of raw honesty. Though personally, I feel it all smells too much like vanilla. PS- that last sentence will only make sense to Bremner fans. But a question here is what is art, and what is propoganda. There have been some stunning artistic visuals which became propoganda pieces, or am I taking the thread in the wrong direction by raising this ? This particular image is regarded as being a seminal one from WW2. However, there are a few things unknown about it. 1. 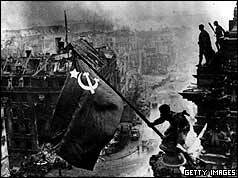 It didn't happen in the midst of the Battle for Berlin, but was "staged" afterwards, a few days after the Russians had taken control, to be specifically used for propoganda purposes. 2. I also remember watching a documentary about it before, which said that after the image was taken, and while it was being developed, the soldier in question was noticed to be wearing two wristwatches. The Russians believed that this could have been seen as "looting by the liberators", and had one of the watches removed from the negative before publishing the photograph. Very hard to define a border between the two. But generally, art might be seen as an expression, or a propaganda, of the artists position. With general propaganda, the artist is communicating someone else's position. Point 1. Indeed, but then there is no shortage of such examples. You hardly think the raising of the flag on Mount Suribachi was taken in the midst of battle? Point 2. I believe the sergeant in question had an armful of "liberated" watches, as opposed to just two. Such photographs are triumphalist pieces, but have little truthful substance to them. A better example of artistic propaganda pieces would be, in my opinion, those photographs taken to portray the barbarity of the other side. Take the below case of a V-2 attack, where a man returned from walking his dog to find his home, where his wife had been preparing Sunday lunch, destroyed. There is a more truthful element to these photographs. But for WWII, it is the cartoons that communicate the best. The soldiers were from Buenos aeries, but they all were American in outlook, accent etc. Yeah, I noticed that too. Though it probably was not the biggest discrepancy in the whole film. "The novel has been recycled into comics, books, films, and television series, the best known being Paul Verhoeven's 1997 Starship Troopers. The film began development with the working title Bug Hunt, but then a friend of Verhoeven pointed out the similarities between his script and the book. A license was subsequently obtained and the script edited to conform more to the book. However, according to the Internet Movie Database, Verhoeven claimed he never finished reading the novel, becoming both bored and depressed after the first few chapters. This may explain the great dissimilarity between the book and the film, and the uproar among Heinlein's fans when the movie was released.. The script reflects a merciless contempt for Heinlein's ideas, which are condemned as similar to Nazism. The film's uniforms, badges, and flags had German and Nazi origins and were clearly intended to imply that the society was racist -- against non-human species rather than human racial or national groups. The film included visual allusions to propaganda films such as Triumph of the Will and wartime news broadcasts. However, this satire was embedded in slickly produced action sequences with clever special effects. Some wonder whether the satire went unnoticed by the audience who may have treated the movie as a simple gung-ho action movie." So what have we got today in Ireland by way of art? What is it that reflects our society? Please add to the list of artists wether they be in music,painting,scultping,writing,dance or otherwise. Humour me because I'm in need of a little cheering up on such a moxy day. I'm updating this theory to include Mission Impossible III. Can any of the more cosmopolitan posters here tell me, do countries like France, Germany or Japan produce films where their agents have to save the whole world- and traverse the globe in the effort? It strikes me that these films (James Bond must also be included) portray a belief that America and Britain are somehow policemen of the world. Such a mindset is of course dangerous at any time, but particularly when the UN's future is far from clear. I'm not arguing that these films are propaganda pieces- though Tom Cruise is running around fighting for the IMF-impossible mission force apparently??? Rather, my point is that they are indicitive of underlying trends.